WASHINGTON (May 01, 2009) -- Secretary of the Army Pete Geren and leaders of the Army medical community gathered at Walter Reed Army Medical Center in Washington, D.C., to celebrate the 100th anniversary of military medical care there. The hospital first opened its doors to patients 100 years ago -- May 1, 1909 -- and initially admitted just 12 patients. Today, the hospital, with many new buildings around it's campus, admits nearly 10,000 patients a year -- including Soldiers, Sailors, Airmen, Marines, Coast Guardsmen, retirees and military family members. Secretary of the Army Pete Geren spoke May 1, at the Centennial Celebration at Walter Reed Army Medical Center in Washington, D.C.
Geren said the recognition was not really about the building, but rather about the military servicemembers who have worked at the institution for 100 years now to provide world-class care to servicemembers who have been injured. "We're not here to honor bricks and mortar," Geren said. "But to honor men and women who devote their lives to the service of others. Today, in much of America, medical care is all about business. Army medicine is all about service -- it always has been. Today we honor a century of that service." The current Walter Reed facilities in Washington, D.C., are scheduled to close in 2011 as a result of the Base Realignment and Closure Act of 2005. But the capabilities and treatment provided at the Washington campus will be moved to nearby Bethesda, Md., where Geren said the standard of care will continue as it has for the last 100 years. "In 2011 when we close this facility, both its name and its legacy will live on at the new Walter Reed National Medical Center in Bethesda," Geren said. 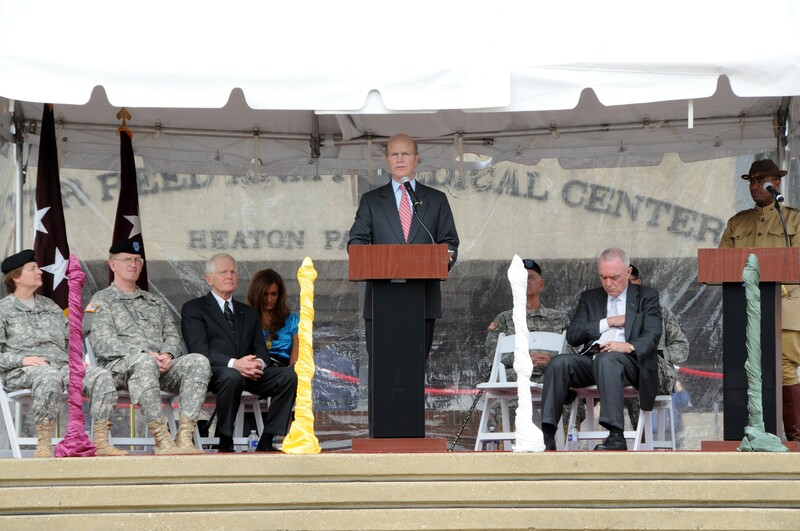 "The men and women who are Walter Reed will continue their outstanding service." Surgeon General of the Army Lt. Gen. Eric B. Schoomaker said that over the last 100 years, the hospital has contributed much to medicine through the work done there, including work in plastic surgery, prosthetics, burn care, battlefield psychiatry, kidney disease, and vaccine research. "(Walter Reed Army Medical Center) led the development of more vaccines than probably any other single institution of medicine in the world," Schoomaker said. "It's estimated that half of all vaccines used on travelers around the world today were developed out of Army military medicine." On the lawn of the hospital, bordering Georgia Ave., several hundred Soldiers had gathered to hear the speeches of Geren, Schoomaker and others, and to listen to the music of the 3rd U.S. Infantry Old Guard Fife and Drum Corps. One Soldier, Pvt. Abraham Odisho, an infantryman, didn't make it down in time to hear the speeches. Accompanied by his mother and wearing a Walter Reed football team tee-shirt and a hat bearing the patch of the 25th Infantry Division, "Tropic Lighting," Odisho rolled out the front door of the hospital in a new wheelchair. Amidst the chaos of ceremony attendees lining up for cake and punch, most who had attended the event didn't notice Odisho. But he represents everything Geren and Schoomaker said about the importance of Walter Reed. Odisho, 20 years old, was admitted to Walter Reed after an injury sustained in Ad Dawr, Iraq, on March 27. "I was the driver for the last truck -- and we were hit by an RKG-3 anti-tank grenade," Odisho said. "The grenade came from the passenger's door, went under my right foot, took off some skin from my right foot and then split my left shin in half. I'm just glad to be alive." After a stop at Speicher Contingency Operating Base, where doctors amputated Odisho's left leg below the knee, and a layover at both Balad and Germany, Odisho found himself at Walter Reed on March 29 -- just two days after the incident. "It was really quick," he said. Odisho said the care he's gotten so far from the Army and from Walter Reed has been good. "They've helped a lot," he said. "Everything I've needed, they've given to me." He says he expects to be up walking on crutches within a week and expects to eventually get an advanced prosthetic to fit his leg. "I figure medicine has come a long way," Odisho said. "Especially for amputees -- there's prosthetics now they have you'd never believed they existed." With his new prosthetic leg, Odisho said he'll finish out the military contract he signed up for just 11 months ago. "I'm gonna try to finish out my four years," he said, "And probably gonna have to re-class -- probably can't be in infantry anymore. I want to do something in intelligence or anything like that."